Where does the customer journey end for your business, does it end with the sale? 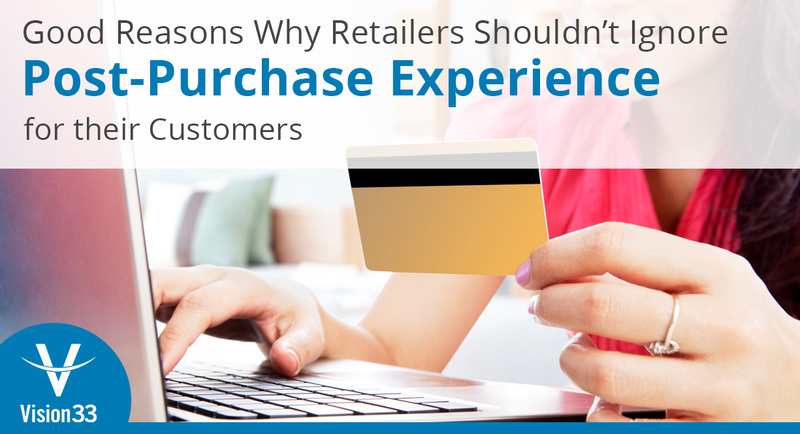 More and more retailers are seeing that the post-purchase experience is equally important for repeat business and customer retention. Neglecting the post purchase process can be a missed opportunity for a positive brand touch point. This interaction can help deepen your relationship with your customer, increase your net promoter score, and ultimately lead to greater customer retention. Many business studies have found that acquiring a new customer is up to 25 times more expensive than maintaining your current customers. If your business can find a way to improve the customer experience beyond the status quo, there’s a huge opportunity for a closer, mutually beneficial partnership that can last for years into the future. Improving this experience however, requires that retailers have a technology solution that can keep pace with services offered by the competition while also possessing the flexibility and extensibility to be customized to meet your business’ needs. To that end, Vision33 has developed portal products in support of the post purchase process that act as gateways to connect the enterprise with the outside world remotely through a mobile device. Vision33 Customer Portal is a web-based self-service solution that provides your customers with complete access to accurate, up-to-date account information from inside of SAP Business One, 24/7. 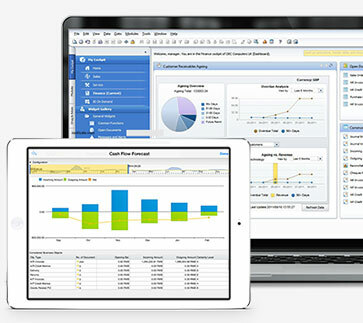 This product expands access to SAP Business One data in real-time. This means that any information you want to access from SAP Business One can be done in real-time from the system, ensuring that your customers obtain access to the most recent data and transactions. You might ask what the key benefit of the Portal is, and really it is about empowering your customers with the tools they need to manage their account with you. This is not only an added convenience of doing business with your company, but more importantly it ensures that at each touch point with the customer you can focus on having more meaningful discussions instead of spending time fulfilling requests for account management. The following is a summary of the key benefits of using the Customer Portal for SAP Business One. Unique user name and passwords protect access to customers information and account details. With a customizable front-end, the Customer Portal provides another opportunity to continuously build your brand with a seamless customer experience. Consistent web browsing experience across all mobile devices, including Android, iPhone, and Windows. The screen will resize to match the browser meeting customers expectation to be able to do business with you in whatever channel they like. Providing customers with 24x7 access to their own data means that companies can move in a paperless direction, reducing time and material related to accounting and service and empower them to enter in their own service calls. Enhance the standard product to meet your unique business requirements. Like SAP Business One, the Customer Portal is designed to work with a variety of different business scenarios and as a result, it contains many out of the box features that most business will find useful. At the same time, we also recognize that no two businesses are alike, and Vision33 has built the portal with extensibility so that it can be customized and enhanced to your specific needs. Interested to see the solution first hand? Take the Customer Portal Test drive and get a first hand look at what your customers would see and how they would benefit from the add-on.